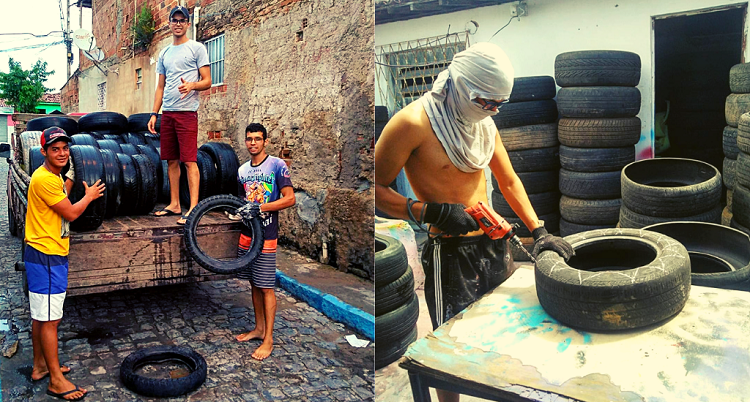 Watch the magical transformation of these old tires here. Amarildo Silva lives in the city of Campina Grande, Brazil. What’s interesting about the city is that stray animals outnumber homeless people by over 500%! Two years ago, the 23-year-old artist started working a job at a local supermarket. But unlike most kids his age, he had a dream of eventually becoming self-employed. One thing Silva noticed about the stray dogs was that they liked to curl up at night in thrown out and used tires that were scattered throughout the city. That’s when he came upon the brilliant idea of re-purposing those used tires into comfy beds that those stray dogs could sleep in. Silva knew that if he wanted to last as an entrepreneur, he needed to make a living doing what he loved. So he went to work collecting the multitude of discarded tires that littered the city’s streets, parking lots, and landfills. 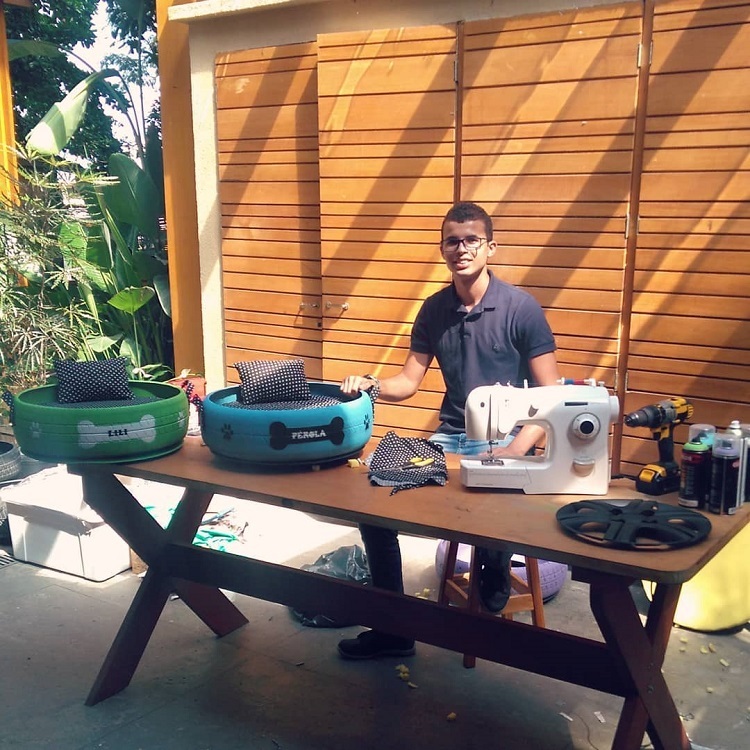 By transforming ugly and used up tires into beautiful pet beds, the young man found a way to incorporate his passion into a successful business. The beds not only gave much-needed shelter to homeless dogs and cats but also helped the environment by drastically reducing the amount of waste lying around. He starts by cutting the tires into the desired shape and then giving them a very thorough scrubbing. Fresh paint is then applied to seal and decorate the bed, adding bone, paw, and heart shapes, or even the pet’s name, if available, to give the bed artistic highlights. Once the basic structure has taken shape and been painted and decorated, he wraps beautifully printed fabric around a nice and plushy cushion to make a comfy base. He then sews the extra fabric into a matching pillow. The end results is a visually stunning pet bed that’s fit for even celebrity pets to lie in! Silva sold his first six pet beds to coworkers at the supermarket and that paved the way for a lucrative and life-changing business. Silva’s business quickly gained attention not just for the positive impact on the environment but also for the compassion that has been shown to stray animals. Invitations soon started coming in asking him to demonstrate his work at schools and local events. 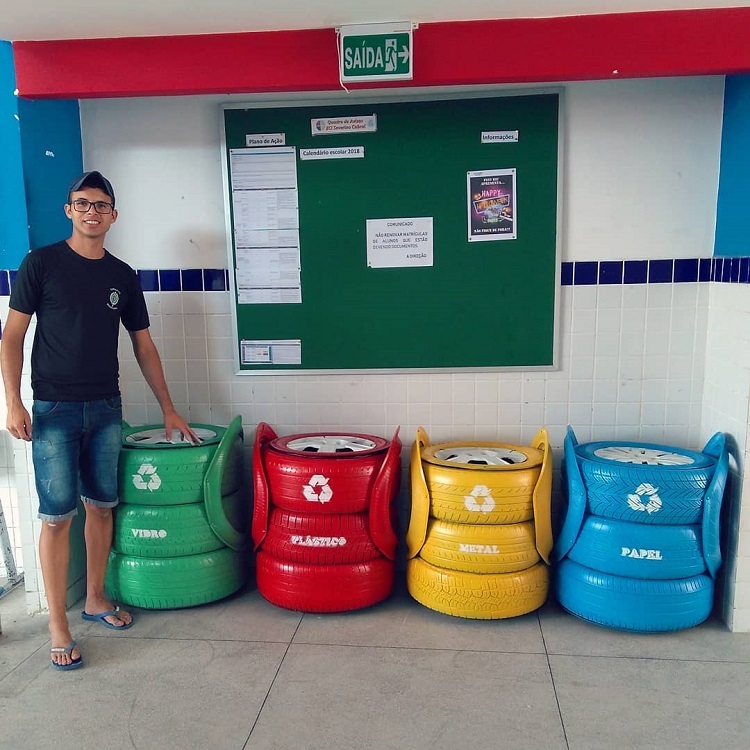 Silva is not only a successful entrepreneur, but he has also now taken on the role of educating people on the importance of sustainability. The lightning-fast growth of his business has convinced him to make turning used tires into beautiful pet beds official. He named his business Cãominhas Pets with social media presence on Facebook and Instagram. Apart from pet beds, his business also makes large, colorful planters out of the used tires, thereby making sure the gardens in his local community become even more beautiful. He has branched out even further by creating sustainable furniture. And if we include the number of other items he has been making from the tires, the number of tire units that were recycled goes up to roughly 6,000! Silva’s journey is an inspiring story that shows us that even one person with a dream can make a huge difference.